The most common, and probably most useful contact point has a large 3 mm diameter carbide ball (.06" radius) set into the cupped end of the point. Only a portion of the ball will be visible. The ball does not rotate and is not designed to rotate. This type of contact point should be used when flat surface measurements are taken. 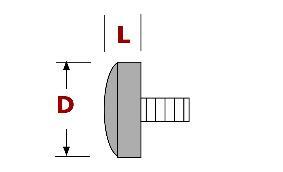 Carbide will provide a long useful life for these points particularly if any sliding motion is involved. Sliding the test piece under the contact point will inevitably wear down the point. For special applications, this ball can be made of synthetic ruby, Teflon or Nylon. The length (L) of the point can be altered by using a separate length extension. With the exception of MTC44-14, these Mitutoyo style indicator points have recessed .120" (8 mm) diameter balls made of carbide, steel, ceramic or ruby. They will fit any brand indicator with the correct thread diameter. 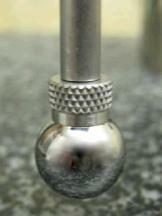 Spherical steel point designed for Mitutoyo indicators but can be used on any other brand as long as you select the proper thread type. Different ball diameters are available for this style. Rather than being incorporated into the contact point, these balls are brazed onto the ends. They're suitable for tracing contours or reaching into grooves, slots, recesses and holes. The diameter (ØA) is .185"
These American-made flat contact points have a carbide face on them. They are about the same diameter as most indicator spindles: .185" (7 mm). You'll be able to get them in a variety of lengths (inquire about lengths not shown below). If you need longer lengths, get an extension. 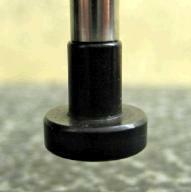 These carbide points will fit all mechanical and digital dial indicators with inch (4-48) or metric (M2.5) threads. (*) We also offer a similar contact point with a nylon surface instead of the carbide. The layer of nylon is about 1.5 mm (± 0.1) in thickness. Radius points are the most common and can be the cheapest of the indicator contact points. The diameter (ØA) is .188" and the radius is 4 mm. There are two styles: they're made of blackened, hardened steel or they have a carbide end, both with a light radius. Although they are available in many different lengths, we think it's best to buy the standard 1/4" length, and then combine it with an appropriate extension. If you'd rather have specific lengths, please inquire. 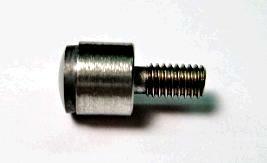 These flat contact points have a recessed smaller diameter carbide disc brazed onto the surface. Refer to the dimensions shown on the drawing. Designed for Mitutoyo dial indicators and digimatic indicators, but can be used on any indicator having the same thread size. Examine the dimensions (D/d/L) carefully to make sure you get the correct point. .2" / .19" / .2"
.27" / .25" / .4"
.41" / .37" / .4"
Although designed for Mitutoyo dial indicators, these carbide needle point contacts will fit any other brand of indicator having 4-48 or M2.5 threads. Keep in mind that carbide is brittle and the longer the point, the more fragile it will be. These button points have large convex discs (hardened, black oxide), useful for special applications of your dial indicators. These are genuine MTC flat black oxide steel button contact points which can be used on any brand indicator, mechanical or digital, providing you have chosen the correct thread size. 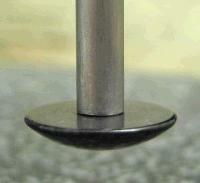 A flat contact is normally used to measure round shapes such as spheres or rods. If it is used for flat surfaces, you will have to make sure it's parallel. The upper surface of the contact point can be used to measure overhangs, undercuts or grooves. Under other circumstances, this type of contact point can be used to measure thickness of foam, soft plastics, fabric or leather where standard contact points would tend to create impressions and result in false readings. The disc thickness is .095" (~ 2,4 mm). These durable flat, disc shaped steel contact points can be used on any brand indicator, mechanical or digital, providing you have chosen the correct thread size. 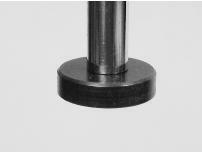 A flat contact is normally used to measure round shapes such as spheres or rods. If it is used for flat surfaces, you will have to make sure it's parallel. Under other circumstances, this type of contact point can be used to measure thickness of foam, soft plastics, fabric or leather where standard contact points would tend to create indents and result in false readings. The carbide tips on these contact points are of a slightly smaller diameter (d) than the rest of the point (D). This feature makes these Mitutoyo style points different from other points, but they can be used on any dial or digimatic indicator with the proper thread size. Length (L) refers to the overall usable length. Carbide balls Grade 25 AFBMA with tolerance of ±.0001" and sphericity of .000025" are mounted on short shafts whose length = B and diameter = C in the chart below. American made. Also, take a look at the "exposed" style 2 contact points. Standard flat steel contact points come in an assortment of lengths. Additional lengths can be attained by using contact point extensions. All have a flat .187" diameter.